Koala is an excellent traveler. The peacocks, the pets trying to travel as service or emotional support dogs, the misbehavior — from pooping pigs to biting dogs — and the “service dog” whelping her litter near gate F81 … it’s all too much. Not only are airlines tightening up their rules on which of our furred, feathered, and scaled friends may board, the Department of Transportation is considering changing sections of the Air Carrier Access Act (ACAA), the law governing air travel with service and emotional support animals. The root of the problem is that federal laws governing access for assistance animals are vague, different laws allow for different things in different spaces (public businesses, housing, and air travel), and it’s easy to exploit loopholes or deliberate omissions in these laws. The result, as far as air travel is concerned, is a mess. In a nutshell, the ACAA allows people to travel with service animals or with emotional support animals (ESAs). 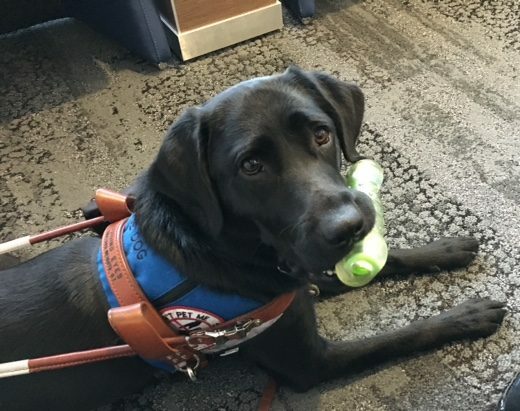 The ACAA definition of a service animal is different from the more familiar ADA (Americans with Disabilities Act) definition; the ACAA definition of ESA is loose indeed. For one thing, no training is required; for another, passengers are not required to crate or otherwise contain the animals during the flight. Problems include threats to (and harm to) the safety of other passengers, interference with legitimate service animals working with their partners, and undue stress on the animals themselves, who generally have had no public access training and should not have to endure a strange, noisy, smelly, stressful, cramped, terrifying experience (air travel is all of that and more for me, and I am used to it!). For more details, read the full notice. Post a comment here. Read others’ comments here. Post your comment by July 9! Pam Hogle, thanks! And thanks for sharing your great posts every week!